^ According to Article 7 of the Law #77-I, lower-level administrative divisions with the status of a settlement have their administrative centers in an inhabited locality with the status of an urban-type settlement. 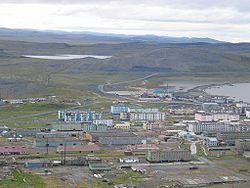 According to the Registry of the Administrative-Territorial Divisions of the Sakha Republic, Tiksi is the administrative center of the Settlement of Tiksi. ^ Якутский аэропорт Тикси закрыт для приёма и отправки рейсов до декабря, причины не названы. Газета.ru (莫斯科). 2012-10-03 [2012-10-04] （俄语）. Barr, William. Baron Eduard von Toll's Last Expedition: The Russian Polar Expedition, 1900–1903. Arctic. 1981, 34 (3): 201–224. doi:10.14430/arctic2524.